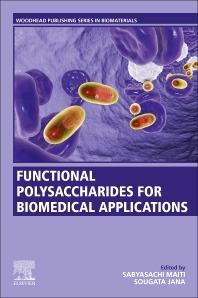 Functional Polysaccharides for Biomedical Applications examines the fundamentals and properties of these natural materials and their potential biomedical applications. With an emphasis on therapeutic and sensing applications, the book also reviews how polysaccharides can be modified for tissue engineering applications. Sections discuss the basics of polysaccharides, give an overview of the potential applications, look at novel materials and technologies for use in tissue regeneration and therapeutics, and detail current biomedical applications. With a strong focus on materials, engineering and applications, this book is a valuable resource for those with an interest in harnessing the biomedical potential of natural polymers. Prof. Sougata Jana currently works at the Department of Pharmaceutics, Gupta College of Technological Sciences, Maulana Abul Kalam Azad University of Technology, West Bengal, India. He attained his M. Pharm (Pharmaceutics) from Biju Patnaik University of Technology (BPUT), Odisha, India. He has been engaged in research for 9 years and teaching for 8 years. He has published 24 research papers in national and international peer reviewed journals, served as lead editor on a reference book and authored five book chapters. He is an active reviewer for various international journals and is a lifetime member of the Association of Pharmaceutical Teachers of India (APTI).